Looking for the best robotic mop to keep your floors clean? In this 15-minute automatic mop buying guide, I’ll review what are the top 6 robotic mops you can buy online. single-purpose robotic mops: all these do are mop our floor. Some use water, while others are dry mops. 2-in-1 robotic floor cleaners: these are combo units that sweep, vacuum and mop your floor. The second thing you need to know is that some robot mops are smart & connected, while others are not. More expensive units often come with intelligent navigation and automatic recharging and can be operated and monitored via your smartphone (over WiFi), while less expensive ones are typically manually set and controlled, requiring you to be home. Finally, prices for robotic mops vary widely – premium $500+ models are more common, but there are a few budget options that cost less than $300. If you are looking for a robot vacuum cleaner instead, I recommend buying a Roomba. See my in-depth comparison of the best-selling Roomba models to find one for your needs. If you own a pet, then definitely check out my recently-updated list of top robot vacuums for pet and dog owners. Are Robotic Mops Really That Good? The following 6 robotic mops are the best units selling today. Click LEARN MORE to see more details on each. The Braava 380t is a 2-in-1 mop. One of its functions is of course mopping. The other is dry sweeping (not vacuuming). The 380t is not WiFi connected and will not recharge itself automatically, but it does use intelligent floor mapping to navigate and clean your floor efficiently. The Braava 380t will only dust your floors using a dry removable cloth, picking up dust, pet hair and other tiny debris as it sweeps. But you’ll still need a vacuum cleaner for those times when your floor needs a deeper clean. The robot can sweep an area of up to 1000 square feet before the battery dies down. The mapping function is limited to just 300 square feet. This is because the robot spends more time mopping, employing a more intensive back and forth action compared to the simple straight line movement it uses while sweeping. So the battery goes down faster. The reservoir is also quite small, just 120ml in capacity. It holds just enough water or cleaning liquid to mop 300 square feet. The Braava 380t comes with a separate cloth for mopping. It keeps it damp by releasing small amounts of cleaning liquid or water as it mops. It’s safe for all kinds of hard floors including vinyl, tile, hardwood, laminate, and others. Note that the sweeping and mopping cloths are reusable. You can wash them and put them back on the robot. You can also use other cleaning cloths such as those from Swiffer. To navigate around the house, the iRobot Braava 380t comes with a separate module it calls the NorthStar Navigation System. It’s a cube that sends out a signal to the robot, allowing it to know where it is and where it has already cleaned. It’s sort of like an indoor GPS. You just need to position it at one corner of the room. For bigger homes, iRobot recommends buying extra cubes for added coverage. Over time, the robot memorizes your home’s layout. It builds a virtual map of the floor, walls, furniture, and stairs. This improves cleaning efficiency and speed. That’s where the Braava’s smarts end. It doesn’t have WiFi, meaning you cannot control it from your phone. It also doesn’t have auto-recharge (it only goes back to where it started from). Fast recharge – takes just 2 hours. Easy to use – just press a button to start cleaning. Super-quiet. Won’t disturb pets or a sleeping baby. No WiFi – you cannot remotely control or monitor this robot. No remote control – this would have been handy for manual navigation. The iRobot Braava 380t is a great choice if you are looking for a capable mopping robot to complement your robotic vacuum cleaner. The bObSweep Pet Hair Plus is technically a 3-in-1 robotic floor cleaner. It mops and vacuums your floor using sweeping brushes and very powerful suction. And it uses UV light to sterilize your floor. The Pet Hair Plus does not use intelligent navigation nor connect with your smartphone, but does come with virtual wall barriers, a handy remote control and offers several preprogrammed cleaning modes that you can schedule. The Pet Hair Plus is best used as a robotic vacuum cleaner and floor sterilizer – the mopping function feels more like an afterthought. For one, there is no water reservoir. To use the mopping feature, you have to wet the included mopping pad yourself and attach it to the underside of the robot. This works great when you need to mop small spaces quickly. But it doesn’t provide the range or thoroughness of robotic mops with onboard tanks. If you decide to get the bOb Sweep Pet Hair Plus, buy it mostly for its vacuuming and dry mopping. It’s very good at that. It uses powerful suction, side brushes and a roller brush to pick up dust and pet hair. The 380t also comes with a HEPA filter and boasts one of the largest bins among robotic vacuums. Use the mopping function only when you need to mop a small room or area quickly. It won’t clean thoroughly or for very long without you having to re-wet the pad. The UV sterilization feature is also unique – and handy if you have pets or kids in your house. While the bObsweep Pet Hair Plus is not as smart as a Roomba or Neato when it comes to navigation, it manages to move around the floor without bumping into things or going over the same areas twice. In addition to a basic navigation system, the robot also relies on multiple infrared sensors to avoid obstacles. It also comes with a virtual barrier that uses lasers to block the robot in two directions. Use the barrier to keep it from getting out of the room or cleaning a certain area such as your cable-strewn work desk or pet feeding area. The Pet Hair Plus is not WiFi-capable, so you cannot connect it to your phone or smart assistant. That said, it comes with a full-featured remote control with manual navigation buttons, a start/stop button, scheduling settings and cleaning modes. Excellent cleaning ability especially when it comes to vacuuming. Easy to use with the included remote control. No water reservoir. Doesn’t provide a thorough mopping and is not suitable for mopping large areas. No WiFi, meaning no remote phone control and no smart home integrations. 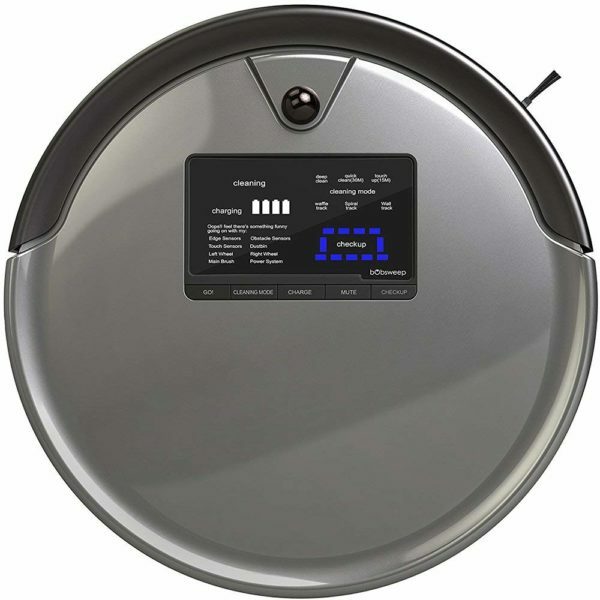 If you are most interested in getting a good robotic vacuum cleaner at a good price, this is a great buy. The mopping function is just a bonus. The mop is most helpful if you have a small home or apartment and your floors don’t get very dirty. If you want a more capable mop that can clean your entire home, consider other options like the Braava 380t. 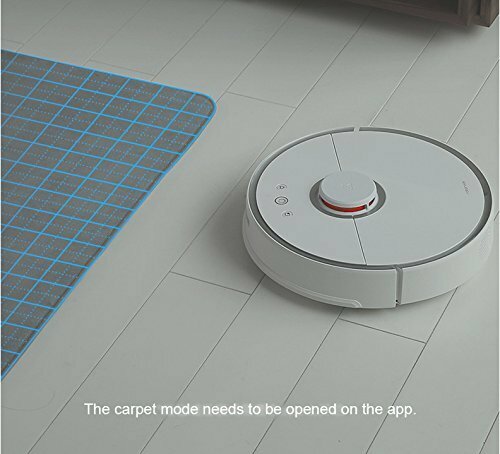 The Xiaomi Robot Rock is a 2-in-1 robotic mop and vacuum cleaner that comes with everything you could want: excellent mopping and vacuuming, intelligent navigation, smartphone control and an auto-recharge function that works great. This is one of the newer Chinese-made models on the market, but it’s one of the all-around best robotic mops we’ve reviewed. Xiaomi, the manufacturer, is a huge well established electronics manufacturer in China, so this is not some fly-by-night cheap gizmo. Definitely one for your short list! The Robot Rock’s vacuuming function is good. It uses strong suction to pick up pet hair, food crumbs and dust plus carries a fairly large bin to dump it all in. The mopping function is very good. Unlike the bObsweep, the Robot rock has a water reservoir, although it’s not very large at 140 ml. But it holds enough water to clean a couple of rooms. When you need to mop, just add water or a mild cleaning liquid and attach the mopping pad. The robot will release water in controlled pulses to keep the pad damp. This is the shortest cleaning cycle of the bunch – the Robot Rock only mops for 45-60 minutes before the battery needs a recharge. Thankfully, it will automatically navigate back to the charging dock. The Robot rock has all the smarts you get in pricier Roomba models. Instead of cleaning in random patterns, it plans an optimal route before it starts cleaning and constantly watches out for obstacles. Using a laser, it scans the room to determine size and layout. Once the mapping algorithm picks the best path, the robot keeps scanning 360 degrees around itself 1,800 times per second to avoid furniture, walls, and other obstacles. It allows the robot to cover a large area in a less time, which means it doesn’t waste time or battery power going over the same areas. Because it remembers and optimizes its path, the Robot Rock can tackle a complex floor layout without getting stuck or lost. This robot floor cleaner is also WiFi connected. You control it remotely through the companion smartphone app. In the app you can set a schedule, start and stop the robot and define virtual boundaries to keep the robot from cleaning certain areas. Smart navigation & mapping = less time to clean. Control and monitor it remotely using the smartphone app. Excellent cleaning ability when vacuuming and mopping. A bargain considering all the premium features. Setting up the WiFi connection can be a bit tedious. Cycle time is rather short. If you are looking for a cheaper Roomba-like robot that can vacuum and mop, the Xiaomi Robot Rock is a great choice. The iLife V8s is one of the least expensive 2-in-1 robotic mop and vacuums you can buy today. It does a fairly good job in both cleaning modes. When it comes to sweeping and vacuuming, its greatest limitation is the lack of a brush roll. It relies on side brushes only to sweep in dust and pet hair into the path of the suction port. As for mopping, it has a water reservoir (thankfully). This keeps the mopping pad constantly damp. It mops a 23ft by 23ft area at a time. It will not deep clean your floor or scrub stains away. But it’s handy if your floor keeps getting dirty with dust, pollen, and other allergens. Being a budget robotic mop, the V8s doesn’t exactly stand out for its navigational smarts. When it’s vacuuming, it creates virtual squares and cleans them one at a time. When mopping, it moves back and forth within a 23’ by 23’ area. It works best in a single room without many obstacles. If the layout is too complicated or if you try cleaning multiple rooms, it could get stuck or lost. But at least it has obstacle detection. You also don’t need to worry about it tumbling down the stairs. It will stay well clear of them. Scheduling and auto-recharge work great. No WiFi / smartphone control. No smart mapping / navigation. If you are looking for a robotic vacuum + mop that cleans well without setting you back too much money, the iLife V8s is a good buy. 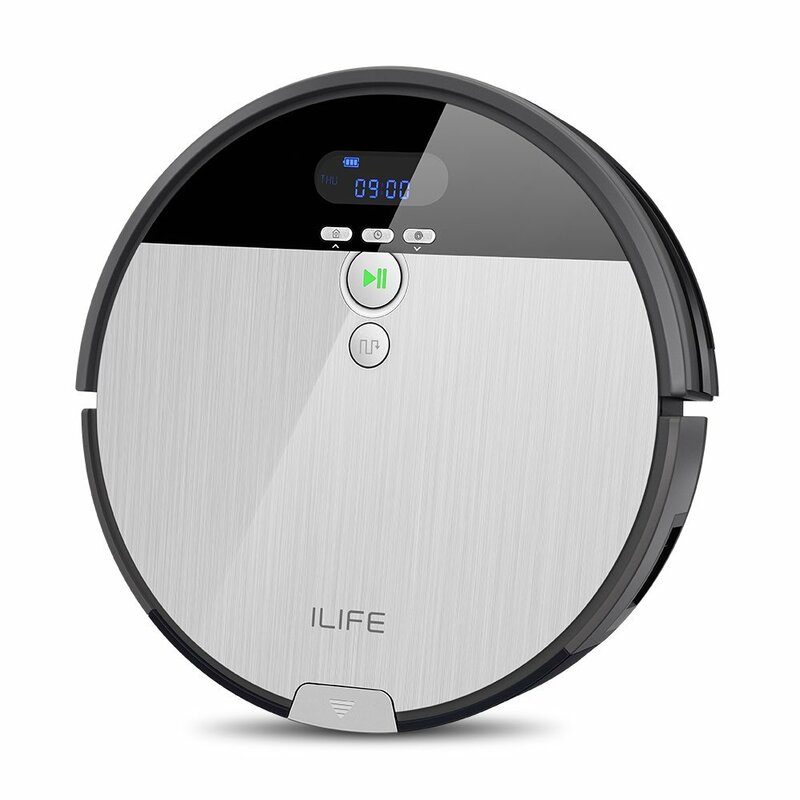 See our in-depth review of the iLife V8s to learn more about its features and cleaning ability. The Proscenic 790T is another good choice if you are looking for a robotic cleaner that can vacuum and mop. 790T’s vacuuming and sweeping are quite good, especially for the price. This Proscenic unit easily picks up dust, pet hair and all other kinds of debris. It can even vacuum a low-pile carpet. It also does a fine job mopping the floor. It has a water tank onboard which releases tiny amounts of water at a time to keep the mopping pad damp. You can feed it plain tap water or a mild cleaning liquid. As with most robotic mops, this cleaner will not deep clean your floor. You’ll still have to mop away the stubborn grime and stains now and then. But for everyday floor cleaning, especially when there’s lots of dust and pollen blowing in, the Proscenic 790T is perfect. There are three cleaning modes to choose from depending on your cleaning needs. The auto mode cleans any accessible floor space until the battery runs out. Edge mode directs the robot to mop along the wall, while the area mode moves the robot around a particular spot. I’m honestly surprised that this robot costs less than $300 considering it comes with remote app control, Alexa compatibility and smart navigation. The navigation is not as intelligent as in a Roomba, but it’s def. better than a random walk. The Proscenic 790T uses a combination of ultrasonic and infrared sensors to avoid obstacles, clean under furniture and stay away from the stairs and other steep drop-offs. But these sensors don’t seem always to help. Some verified owners have complained that it sometimes bumps too hard into furniture. The 790T also come with a good auto-recharge function. When the battery gets low, it will automatically go back to the dock to recharge. As for controlling the robot, you have three options. The Proscenic 790T comes with remote control; you can connect it to WiFi and control it from your phone; or, you can connect it to Alexa and control it via voice commands. These are features you’d normally find in a $500+ robot vacuum. So, yeah – this one is a great deal. Sometimes bumps hard into furniture. This is one of the least expensive robots that offers Roomba-level features. If you want a robot mop + vacuum with remote app control and Alexa compatibility, then you won’t find a better bargain than this. Many customers are surprised at how much dust and debris the M80 collects. The combination of spinning brushes, a roller brush, and powerful suction makes it best-in-class at sweeping and vacuuming hardwood and tile floors. The Deebot M80 Pro also does a great job mopping the floor. Just add plain water to the water tank and attach the mopping pad. If you want to use cleaning liquid, Ecovacs recommends adding to the pad itself rather than to the tank. The tank is small, so don’t expect the M80 to mop your entire house without a refill. You’ll still have to mop the floor occasionally for a more thorough clean, but the M80 allows you to do this a lot less often. It’s especially handy if you have pets or kids around and your floor gets dirty quickly. The M80 Pro doesn’t use a smart mapping and navigation system. Instead, it cleans in a random pattern except when in edge or spot cleaning mode. It will take longer to finish cleaning a room, but it will still get the job done. And if no one is home – who really cares? When the battery gets low, it automatically docks to recharge. Like the Proscenic 790T, the Deebot M80 is surprisingly feature-packed for its price. There are only a a few other robotic vacuums that cost less than $250 that also have WiFi connectivity, smart phone control and Alexa integration. Once you connect the M80 to your home network, you can control it from the ECOVACS app to select cleaning mode, set a schedule and start/stop the unit. You can also link it to Alexa and control it via voice commands. Gets stuck on cables. Make sure the floor is clear before it starts cleaning. No intelligent mapping & navigation. The Deebot M80 Pro is an insanely affordable robot mop + vacuum that boasts smart features like remote app control and Alexa voice control. It’s a great bargain for anyone looking for a 2-in-1 robotic cleaner. OK, so this needs to be said: don’t throw away your old stick mop, just yet. The robotic mops and vacuums reviewed on this page are not up to the job of fully replacing good-ole manual effort. Even the best robotic vacuums will struggle to clean a thick carpet, for example – and there are some areas they simply cannot reach. So you’ll need to vacuum now and then manually. The same limitations apply to robotic mops. Today’s best robotic mops do a fine job getting rid of dust and other allergens on hard floors, but they don’t thoroughly scrub the floor or remove tough stains. You will still need to use your old mop occasionally. But despite their limitations, robotic mops do save a ton of time on weekly chores. If you have kids or pets, you know how quickly the floors get dirty. Instead of mopping every few hours, just add some water to the robotic mop, attach the pad, and let it go to work. Most robotic mops also do a fine job cleaning a hard floor. They get rid of dust, pollen, pet hair and other small debris on the floor. You can also trust all of these units with your floor. Most include a water tank from which small amounts of water are released onto the mopping pad to keep it damp. This ensures the robot doesn’t leave too much water on the floor. So you can safely use it on all types of hard floors including hardwood. Added features like cleaning modes, scheduling and auto-recharge are making robot mops a lot easier and more convenient to use. Most robotic mops are 2-in-1, that is, they both mop and vacuum. If you don’t already have a robotic vacuum in your house, then these are the best types of robot mops to buy today, in our opinion. They save you money because you don’t have to buy a separate robotic vacuum. If you already have a robotic vacuum, then consider a less-expensive dedicated mop like the iRobot Braava 380t. It can dry-sweep and mop the floor. Unless you are just looking for a robot to keep dust and lint off hard floors, then you should definitely buy a robotic mop with a dedicated water reservoir. Having an integrated reservoir makes it possible for a robot mop to clean sticky spots up and cover a larger area. Most robotic mops have fairly small reservoirs, however. This is a limitation that is hard to avoid regardless of which mop you buy. But the reservoirs are easy to refill if you need to clean several rooms or an entire level. Most budget robotic mops work best in small and mid-size homes. If you have a larger home, you are better off investing in a pricier and smarter multi-room robot like the Roomba 980. A premium robot will have a bigger battery and better smarts for navigating an expansive floor layout. From our list above, the iRobot Braava 380t and Xiaomi Robot Rock are the best choices for larger homes. The others are more suited to small and mid-sized homes and apartments. Finally, decide whether you want a robotic mop with smart features like smartphone control, which lets you remotely control and monitor a WiFi-connected robot vacuum or mop from your smartphone app no matter where you are. You can also integrate it into your smart home and control it via voice commands using smart assistants like Alexa. Another feature that worth paying more for is intelligent mapping and navigation. This is usually present in $300+ robots. Intelligent-navigating robotic vacuums and mops use sensors and algorithms to scan your floor layout and calculate the best cleaning path. They are most beneficial in large homes with a complex layout. For smaller homes and apartments, a ‘dumb’ robot that cleans randomly may work just fine. It may take a bit longer to clean, but it will still get the job done without missing too many spots.